The ISM nonmanufacturing index pulled back to 56.1 percent in March from 59.7 in February. In March, 12 industries in the nonmanufacturing survey reported growth while 4 reported a decrease in activity. The nonmanufacturing employment index increased slightly to 55.9 in March, versus 55.2 in February, and has been expanding for 61 consecutive months. 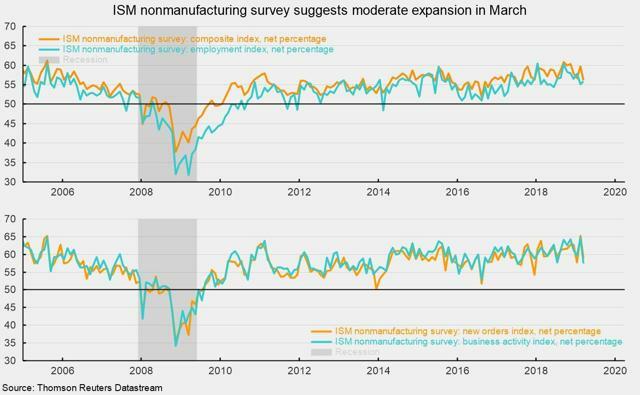 The Institute for Supply Management's (ISM) nonmanufacturing index pulled back to 56.1 percent in March from 59.7 in February (see top chart). For this index, 50 is neutral, with readings above 50 suggesting expansion and readings below 50 suggesting contraction. Typically, the index ranges between 50 and 60, with dips below 50 during recessions. Historically, readings above 48.6 percent have suggested expansion of the overall economy. The March result is the 110th consecutive reading above 50 percent and the 116th month above 48.6 percent. Among the key components of the index, the business activity index (equivalent to the production index in the ISM manufacturing report) was 57.4 percent in March, making March the 116th consecutive month above 50 (see bottom chart). In March, 12 industries in the nonmanufacturing survey reported growth while 4 reported a decrease in activity. The nonmanufacturing new orders index came in at 59.0 percent, down from 65.2 in February. March was the 116th month of readings above 50 (see bottom chart). The new export orders index, a separate index that measures only orders for export, was 52.5 percent in March and has been above 50 for 26 consecutive months. The nonmanufacturing employment index increased slightly to 55.9 in March, versus 55.2 in February, and has been expanding for 61 consecutive months. Twelve industries reported expanding employment in March, while four reported contraction. Supplier deliveries, a measure of delivery times for suppliers to non-manufacturers, came in at 52.0, down from 53.5 in February. It suggests suppliers are falling further behind in delivering supplies to non-manufacturers, but the slippage has decelerated a bit from the prior month. Supplier deliveries have been slowing for 39 consecutive months. Prices for input materials and services rose for the 22nd month as the price index rose to a reading of 58.7 in March versus 54.4 in February. The index had been running above 60 from late 2017 through late 2018, before easing back in the last few months. Tariffs complicate the outlook for input cost pressures and, in conjunction with a tight labor market and rising wages, suggest significant pressure on profit margins. 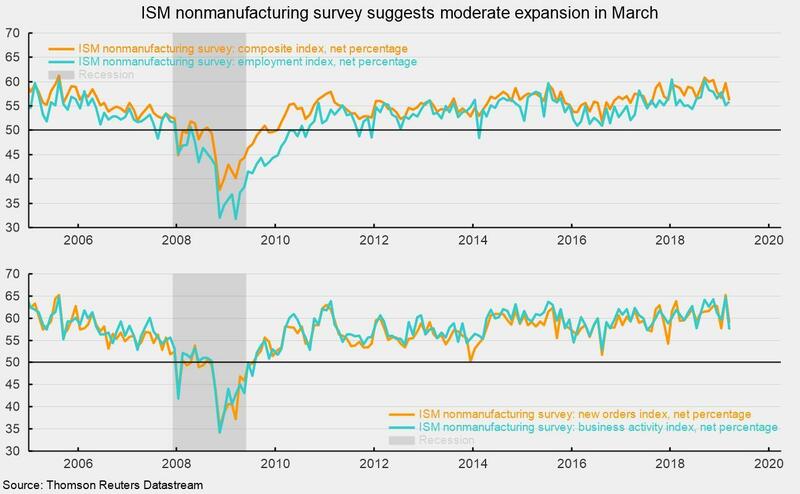 Today's report from the ISM suggests the nonmanufacturing sector continued to grow in March but at a more moderate pace. Despite a pullback in the latest month, solidly positive readings for new orders, activity, and employment suggest a modestly positive outlook for the services sector. The results are consistent with a range of economic data that point to uneven growth, but they do not suggest a recession is imminent.